Not everyone makes it all the way to reconciliation. You can’t get there alone. If your partner has not done his part, you’ll have to settle for Personal Peace. Personal Peace is nice; but, because it’s personal, you can’t share it. If you have done your part to arrive at reconciliation, you’ve already experienced much of Personal Peace. You assessed the injury and noted the part of you that can’t be hurt. You put the damage in perspective and have not been carried away by your feelings. You acknowledged your role in the matter and have done what you can to make that part right. You’ve asked for the kind of justice you can get, in an effective manner, and waited long enough for it to be delivered. If you have done all that and your partner has not, you won’t have a true reconciliation; but it may not matter so much anymore, at least you are starting to have a sense of Personal Peace. In Personal Peace, you can’t change the past or undo what has happened. You’re not going back to the way things were in the beginning. You’re at peace with what happened. You haven’t effected change or stopped her from harming anyone ever again; but you’re making the best of a bad situation. You took a bushel of sour lemons and made gallons of delectable lemonade. Your father was abusive to you as a kid. He called you names and beat you on more than one occasion. He never seemed happy with anything you did. This affected you deeply and caused you to be more than a little screwed up. After you grew up, whenever you tried to bring up his mistreatment of you, he said you were whining. Now he’s old and demented he doesn’t know who you are. You can go to therapy, nurture your inner child, and do your darned best to not repeat his performance on your own children, but reconciliation ain’t happening. He’s incapable of reconciliation. You could forgive him for what he’s done, act like the loyal child, and visit him in his nursing home every other day; but it’s not reconciliation unless he does his part. You’d be doing something good, acting with generosity, forgiveness, and grace; but it’s just you who’d be doing it. You’d be doing it for him as you would want someone to do it for you. But don’t call it reconciliation, ‘cause it’s not. All by yourself, you have made an undeserved gift of healing and gave it to him. You can be proud of that. What you did is analogous to giving money to a beggar on the street, versus giving him a job like raking your leaves so he earns his own money. It’s better when he earns his own money; better for him that he can make a fair exchange, retain his dignity, and contribute to the tidiness of your suburban subdivision. It’s better for you in that you get your leaves raked. When he doesn’t earn his own money, he runs the risk of becoming dependent on your largess, and you run the risk of lording it over him. However, not every beggar can earn his own money, and not every offender can do what needs to be done for reconciliation. Some beggars can’t hold a rake, or you may not have leaves, or you don’t want to let them in your car and give him a ride to your subdivision where he can rake. Some beggars have nothing they can do that you’d want. In the same way, not every offender is capable of reconciliation, and I think that an elderly father with Alzheimer’s might be one of these. The best you can do is to give him the forgiveness he cannot earn. You can feel good for doing so. In this case, granting forgiveness is worth more to you than it is to him, anyway. It’s not like he can beat you anymore. You’re not going to have him babysit your kids or expect him at your dance recital and not point out every mistake you made. You can visit him at his nursing home, as if the bad stuff never happened, because it makes you a better person for doing it and he barely notices. A spouse who is so lost in addiction that you barely recognize her might be another example of when reconciliation is impossible. You can’t even count the number of times she swore she would get clean, but disappointed you. Every word out of her lips is a lie. She can’t even take care of herself, much less take care of your hurt feelings. If you’re expecting her to turn it all around, stop doing the dope, and make amends for all the harms she’s caused you, then you may be expecting too much. She might be able to do it, eventually; but not anytime soon. Whether reconciliation is possible in this example depends on how much time you have and what it costs you to bear with her. By sticking with her, she may be accruing a massive debt to you, digging a bigger hole that she will never be able to climb out of. Breaking up with her while she’s doing harm to you may be the kindest thing you can do for her, as well as for yourself. Reconciliation is a tough road. Those who try to do it while, at the same time, battling addiction, don’t make it. They have to learn to manage the addiction first before they can take care of the harm they have caused you. There are many cases where reconciliation is impossible now, but may be possible later. If it’s impossible now, it’s best to stop trying. Abandoning reconciliation temporarily means you have that much less aggravation to endure, one less fight you have to fight. You can turn your efforts to something that’ll actually make a difference, like seeing your friends, volunteering at a soup kitchen, or trying a new recipe for veal saltimbocca. You can abandon reconciliation for twenty minutes while you take a walk to clear your head or for twenty years, which may be as long as it takes for her to get serious about her addiction. You can abandon reconciliation for good or leave the door open for when she’s ready to try. 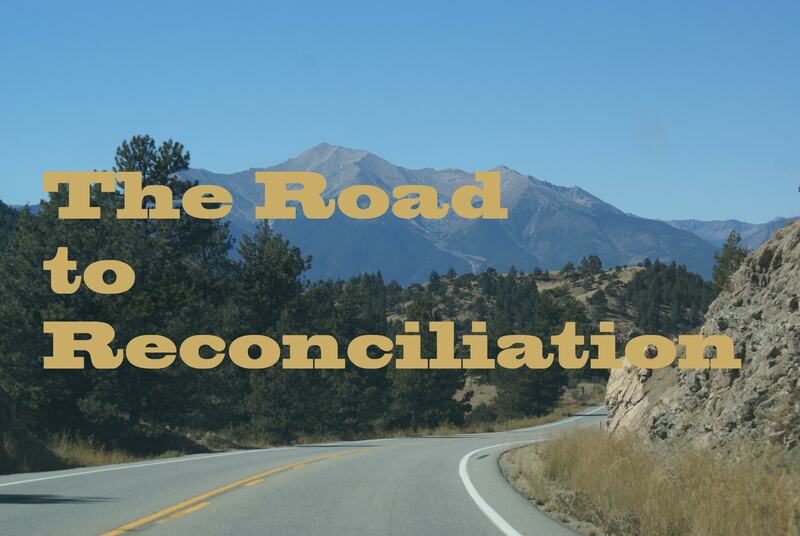 Reconciliation is a worthy goal; but the road to reconciliation is a difficult road. Like every road, it needs a place to pull over for when you can’t go on.